SCOTTSDALE, Ariz. – December 22, 2017 – Barrett-Jackson continues to build an impressive docket with the addition of 21 cars from the Steve Todhunter Collection that will cross the block during its 47th Annual Scottsdale Auction, January 13-21, 2018, at WestWorld of Scottsdale. The Scottsdale-based collection features a spectacular combination of exotic and domestic cars, including a low-mileage 2015 Ferrari 458 Italia Speciale Coupe (Lot #1476), a 2018 McLaren 720S (Lot #1480) and a 1978 Chevrolet Corvette Pace Car (Lot #1489), the first Corvette pace car that was ever offered to the public for purchase. 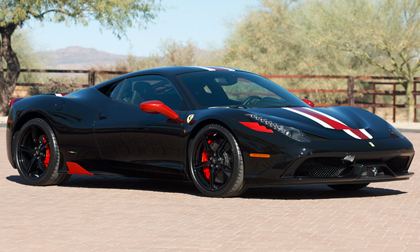 Among the stunning exotics in the collection is a trio of Ferraris. A 2015 Ferrari 458 Italia Speciale (Lot #1476) with just over 900 actual miles is one of 499 built and is powered by a 4.5-liter 597hp V8 engine backed by a 7-speed dual-clutch automatic transmission. A 2009 Ferrari 430 F1 Scuderia 16M Spider (Lot #1478) is also one of 499 built, featuring a 4.3-liter V8 engine with 6-speed manual transmission and just over 1,800 actual miles. Rounding out the Ferraris is a 2014 F12 Berlinetta (Lot #1482) with just over 2,700 actual miles and a 6.3-liter 731hp V12 engine backed by a 7-speed-dual clutch automatic transmission. Rivaling the Ferrari supercars in the collection is a 2018 McLaren 720S (Lot #1480) finished in Azores over black interior with a 4.0-liter 710hp twin turbo-charged V8 engine backed by a 7-speed dual-clutch automatic transmission. A rare and meticulously kept 2015 Bentley Continental GT3-R (Lot #1483) is #51 of just 99 built and is powered by a twin-turbo W12 engine with 8-speed automatic transmission. The collection will also send two 2016 Porsches across the block, a 911 Turbo S (Lot #1479) with just over 1,800 actual miles and a 3.8-liter twin-turbo 572hp engine, along with a GT3 RS (Lot #1477) featuring just over 300 miles, a 4.0-liter 500hp flat-6 engine and 7-speed dual-clutch automatic transmission. The 21-car collection also highlights top domestic automakers, including a 1978 Chevrolet Corvette Pace Car (Lot #1489) that shows just 44 original miles and is the first Corvette pace car that was ever offered to the public. Another Corvette, a 2015 Z06 Convertible (Lot #1485), produces 650hp from its 6.2-liter supercharged V8 engine mated to an 8-speed paddle-shift automatic transmission. A 2017 Dodge Viper GTC ACR (Lot #1481), #5 of 10 Viper GTC Time Attack models built, features an 8.4-liter V10 engine backed by a 6-speed manual transmission. Ford is also well-represented in the collection, with offerings that include a 2008 Ford Shelby GT500 Super Snake Convertible (Lot #1487) with a 5.4-liter 625hp V8 engine and 6-speed manual transmission. The entire Steve Todhunter Collection, along with the 2018 Scottsdale Auction docket is now available to view online. Click here to consign a vehicle or visit Barrett-Jackson.com/Bid for information on becoming a bidder. Advance tickets, three-day ticket packages and information on VIP Packages are available at Barrett-Jackson.com. Also, follow Barrett-Jackson on Facebook, Instagram, LinkedIn and Twitter for the latest news and information heading into the 2018 Scottsdale Auction.